This is something that changes every time I make it. 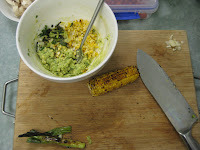 The addition of barbecued corn and spring onion gave this version more depth. If you haven't used the lemon/lime combination before, it is definitely worth trying. Slice the corn off the cob with a sharp knife. Finely slice the spring onion. Combine all of the ingredients with half of the juice. Check for seasoning and add more of whatever is missing and as much of the remaining juice as necessary. Could benefit from some chilli I guess.